Much has been written about David Allen’s “Getting Things Done” action and time management system (GTD). Many websites have come into existence to help people organize their lives, projects, and time around GTD methodology. GTD software solutions have been developed as well for people who do not want a web-based GTD system. It is a system geared toward the overly busy, technically bombarded lifestyles many people live today. This installment of Lesser Known Applications for Linux provides approaches to getting things done. As I return to work on Monday after a summer of unexpected unemployment, I will need a system to keep me organized and productive. I work in Ubuntu 7.04 on my home computer at my desk and on a laptop on the road or sometimes simply from the dining room table or living room recliner. I do not want to be limited to a web-based GTD system, because I like to go “off-line” with the laptop to work with less distractions on a screenplay in Celtx or a novel in OpenOffice.org. Some applications for GTD in Linux that I have explored are Tomboy, Tracks, Thunderbird with the Lightning calendar extension and ThinkingRock 2.0 Epsilon. Reviews for each follow. Tomboy presents a interesting approach to GTD. There is no doubt it can remove clutter and add organization. The version in the Ubuntu 7.04 repositories is only 0.6.3 which was the last stable release available when Ubuntu 7.04 was released. The Tomboy developers released version 0.8 just September 17. With version 0.8, the plug-in system has changed to Mono.Addins. For GTD, some Tomboy plug-ins should be turned on. 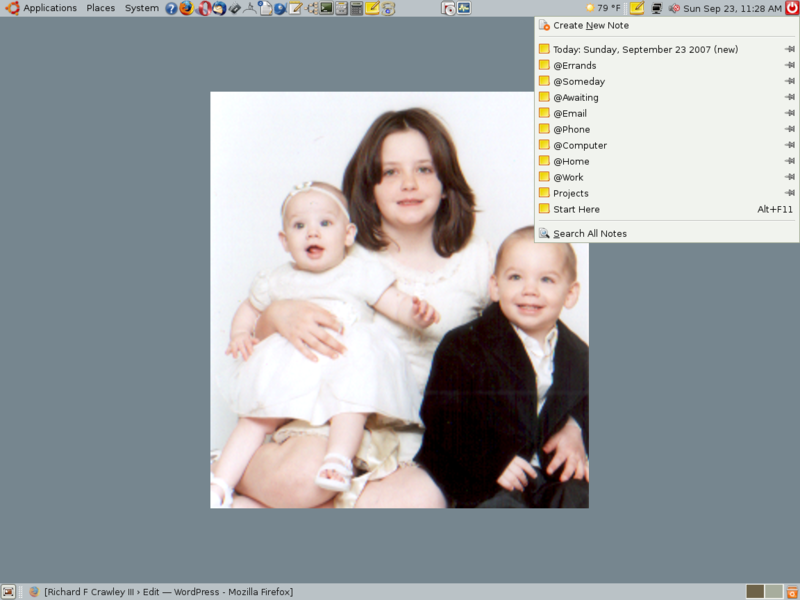 This is accomplished by right-clicking the Tomboy applet icon, selecting “Preferences,” selecting the “Plugins” tab, and checking the box(es) of the plug-in(s) to be enabled. The plug-ins to enable are: Note of the Day, Backlinks, and if you use Evolution for email, the Evolution plug-in. I do not use Evolution, so I will only mention that the Evolution plug-in allows one to drag email from Evolution to a Tomboy note. The Note of the Day plug-in provides a note for today’s notes, tasks and appointments. The Backlinks plug-in shows which notes link to the note currently being viewed. Tomboy is great for collecting, processing, and organizing. It does not do calendaring. The Evolution plug-in would help accomplish that. Tomboy is a quick, versatile application that may satisfy your GTD needs with the addition of a few plug-ins. Mozilla Thunderbird is an excellent GTD email client when combined with the Lightning calendar extension. Lightning is based upon the backend code of Mozilla Sunbird, which is, itself, a standalone calendar application. Lightning provides a calendar, to do list, and agenda. 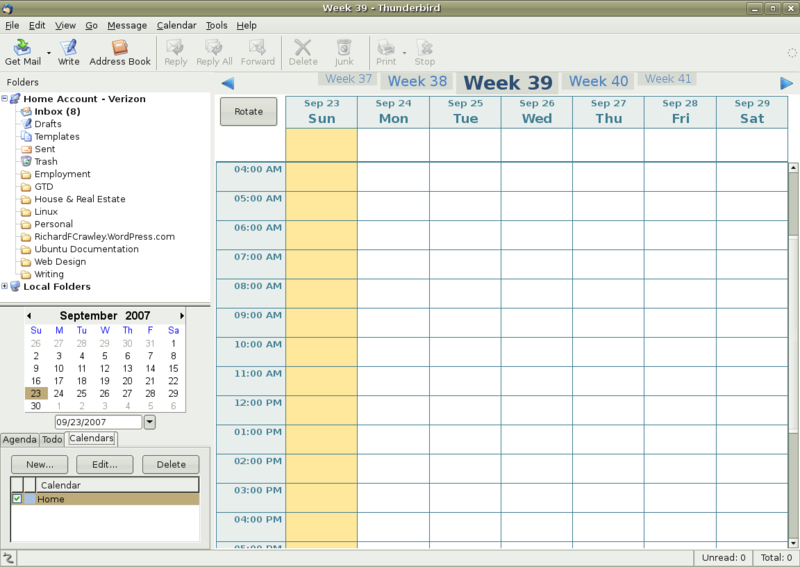 Multiple calendars can be setup, so one can have separate calendars for work, home, school, hobbies, events, family, etc. To help setup your calendar, holiday calendars denoting recognized holidays can be imported into Lightning. The holiday calendars are available for download from Mozilla’s website. Lightning’s to do list and agenda come in handy for scheduling tasks, meetings, appointments, and errands. Thunderbird and Lightning form a nice component to a GTD methodology. Evolution is another fine email and calendar application that can be used to address the scheduling, tasking, and emailing components of one’s GTD methodology. It is more integrated than Thunderbird extended with Lightning. Evolution is a solid part of a GTD practice. It does very well at all of the things Thunderbird and Lightning do. If my computer had more RAM — it has been stuck at 256 MB for quite some time — then I probably would be using Evolution. It has a bit more of a memory hit on slower, older computers than Thunderbird. Yet it is still workable with only 256 MB of RAM. Just a bit sluggish at times. 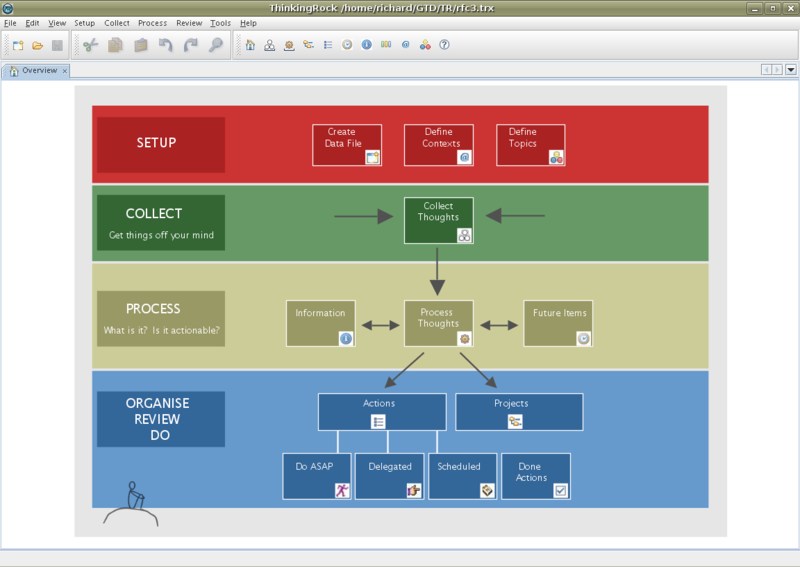 A solid GTD application for collecting and processing thoughts is the Java-based ThinkingRock. Despite its Java programming, it is nimble. ThinkingRock recently went open source. This should enhance its continued development. Upon opening ThinkingRock, one is greeted with an “Overview” page. One can think of it as a flowchart to help depict the GTD methodology visually. It also helps those unfamiliar with GTD hit the ground running. Spending time on the three “Setup” components goes a long way toward effectively utilizing the collection, processing, organizing, reviewing and doing phases of GTD. One of the strong points of ThinkingRock is the ability to group projects into subprojects. It benefits large projects by allowing them to be divided into more manageable tasks. Since I am writing a screenplay, developing a few screenplays, and writing a novel in my spare time, being able to breakdown a project into subprojects is a major advantage to keep each of the projects progressing. My late maternal grandfather did not need to use a GTD approach. He simply did the things he needed to do. He did not have the interfering aspects of technology in his life. Life was a fuller experience for him. I think for most of the World War II generation, a person lived simply and generously. Unfortunately I do need a GTD solution and so do many people today. People live to the point of distraction with technology. I seek to use GTD to simplify and organize my life. So my GTD methodology meets my needs and lifestyle and it continues to adapt as situations and life itself change. My approach is not strictly David Allen’s GTD or Leo Babauta’s simplified Zen To Done (ZTD) methodologies. It gravitates a bit more toward ZTD, but that may be a result of my interests in the simplicity of Zen. My system developed alongside the resources I had available. It includes a hipster PDA, Thunderbird with the Lightning extension, and ThinkingRock. It is not a perfect system and like any system, it works only as well as I do in adhere to it. If I slough off, it stops working. If I stay on it and its application, then my GTD methodology works for me. For more information, check out the links above. Other applications exist, such as Tracks and GTDTiddlyWiki-Plus. For information on GTD, read Wikipedia’s description. There are many great websites on GTD available by performing a web search. Nice article. I find freemind on Linux to be more productive than Thinkrock. It is a mind mapping tool. Nevertheless, you can use it to get things organized, logging all that you have done so far, etc. The export options comes very handy for projects of notable size. Personally, I prefer Tomboy for updating things that I do now and then (task lists) and FreeMind to consolidate all the things that I have done (work list). I must mention that I am a great fan of ZTD (ZenHabits). Living up in the middle of nowhere (though enough of a somewhere for DSL :-), just ran across GTD methodology when searching on “drag and drop to do list”. Another search, probably “GTD Ubuntu” brought me here. Okay, I’m lazy but any desire to do an update now that it has been almost two years? If not, at least I’m pointed in the correct direction.